Investigators searching for a lost plane carrying Premier League footballer Emiliano Sala have said an underwater search would begin after they found two seat cushions on the French coast that likely belonged to the aircraft. The 28-year-old Argentina-born forward had been en route from Nantes in western France with pilot David Ibbotson to make his debut for Welsh team Cardiff City when the plane disappeared over the English Channel on 21 January. Britain's Air Accidents Investigation Branch (AAIB) said it was informed on Monday that part of a seat cushion had been found on a beach near Surtainville on the Cotentin Peninsula in northern France. Due to weather conditions, the search would start at the end of this weekend and take up to three days. 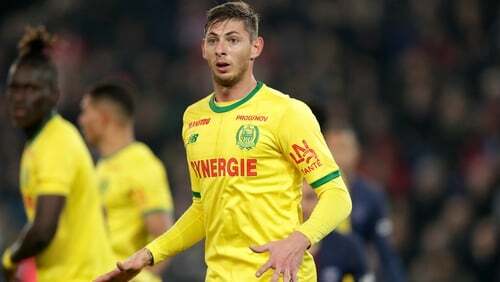 Sala had been travelling from Nantes to make his debut for Premier League side Cardiff City after being signed for a club record fee of €17 million. The plane had been cruising at 1,525 metres when the pilot requested to descend to a lower altitude on passing Guernsey. It then lost radar contact at 700m. Last night Cardiff played their first game since Sala's disappearance, a 2-1 Premier League defeat at Arsenal, where tributes were paid to the missing player and pilot.